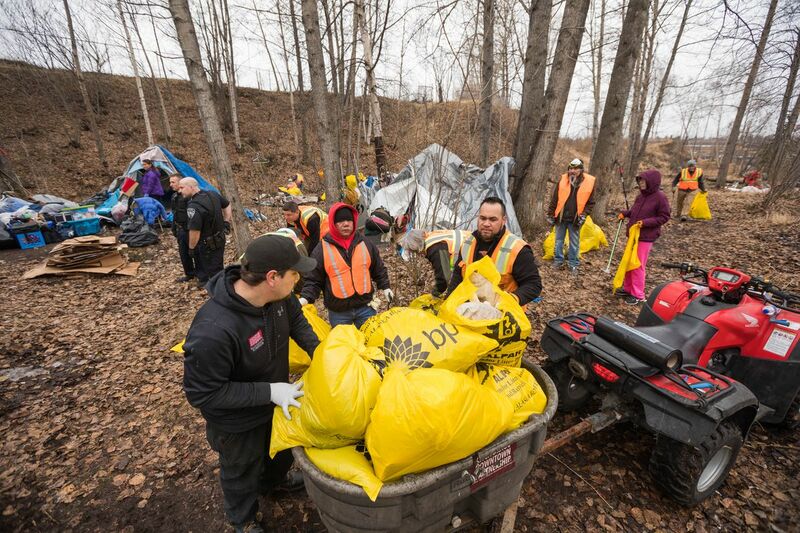 Under pressure from critics who say Anchorage is too slow to clean up illegal homeless encampments in parks and greenbelts, police and city officials have proposed a way to notice and clean multiple camps from large swaths of public land instead of on an individual basis. But like previous plans for camp cleanup procedures, the proposal may be headed for legal challenges. Officials say a backlog of garbage, human waste, bottles and hypodermic needles has accumulated in the woods and created a public health issue. The current cleanup system is prioritized by complaints instead of location, meaning camps are cleaned on a scattered basis, said Nancy Burke, the city homelessness coordinator. Ten-day eviction notices must be posted on individual camps: If a new camp pops up next to an evicted camp, the clock re-starts. A new law, introduced by Assemblyman Christopher Constant, would let the city designate "cleanup zones" for illegal camps. Campers within a zone would get 15 days to move before the area is cleared and belongings are thrown away, the proposed law says. The cleanup process could take a week or more, said city Parks Superintendent Josh Durand. A total of 15 parks staff members are dedicated to camp cleanups this summer. Lt. Jack Carson, who oversees the police unit in charge of evicting camps, said the new approach would be more efficient and result in much cleaner parks. The proposed law is the latest in years of city efforts to get a handle on illegal camping and homelessness. It drew immediate condemnation from the ACLU of Alaska, the civil rights organization that has spearheaded past legal battles over the issue. "Unfortunately, with this latest ordinance, the Muni is demonstrating where its priorities lie: making life harder for people living without housing or shelter, rather than delivering long-term solutions," Casey Reynolds, a spokesman for ACLU of Alaska, said in a statement. In recent months, frustration over what some neighbors see as "homesteading" along Anchorage's famous greenbelts has given birth to citizen activism and homegrown cleanup efforts. Stephanie Rhoades, a former Alaska judge, is among the vocal critics, asserting that current policies enable entrenched camping, criminal behavior and hazardous conditions. Constant, the Assemblyman who represents downtown, said the city's piecemeal approach to cleaning camps isn't working. "The reality is, we need a public health approach to this cleanup procedure," Constant said. He noted his proposed law expands on appeal rights for people who are camping. In the proposal, the city would use landmarks to post notices and designate an entire area as a cleanup zone for illegal encampments, said city attorney Rebecca Windt-Pearson. Right now, if police post a notice on an individual camp, there's nothing stopping someone from coming in the next day and setting up camp right next door. The city has been met with repeated legal challenges as it's tried to develop procedures around illegal camps. The ACLU of Alaska has won in court on arguments that campers need notice and shouldn't lose belongings in a matter of days. In 2011, following an ACLU lawsuit, an Anchorage judge struck down a law that allowed authorities to clear out homeless camps with five days' notice. The judge, Mark Rindner, said many people in the camps are chronic alcoholics or mentally ill and need time to gather belongings and find another place to live. Police could make arrests for criminal activity but couldn't order people off public land and throw away belongings, the judge ruled at the time. Carson, the police lieutenant, said the proposed zone cleanup law balances expediency with campers' civil rights. Cleanups would not necessarily not happen more quickly, Carson said. But he said patient residents would see a visible difference in city greenbelts and parks as the city clears out a years-old backlog of abandoned camps. At the same time, the city is working on ways to move the most difficult-to-house into homes, based on vulnerability, said Burke, the city homeless coordinator. The proposed law doesn't contain size limits on a cleanup zone. Carson said police would pay attention to the amount of space available at city shelters. He also said police would not be able to declare all of the city's parks a no-camp zone — the courts have spoken on that, Carson said. "We want to follow those recommendations by the court but we're trying to do our job and serve our community that's demanding and wanting a cleaner park strip," Carson said. Reynolds, with the ACLU, said in the statement that campers deserved individualized notice before belongings are seized. Areas that might qualify as cleanup zones include the greenbelt along the Chester Creek Trail by Valley of the Moon Park and Sullivan Arena, and city land near Third Avenue and Karluk Street, said Durand, the city parks superintendent. Right now, police, parks crews and city officials use an app to coordinate cleanups using data from complaints. The Assembly is expected to debate the proposed new law in the coming weeks.